Google Zeitgeist 2013 - What We Searched For? Earlier this month Google released its annual list - Google Zeitgeist - of most searched for terms and words of the year. Let's take a look back at this year's digital year and how we spent it. Globally, the five trending terms with the largest increase in search volume since 2012 were Nelson Mandela, Paul Walker, iPhone 5s, Cory Monteith and Harlem Shake - quite an interesting and balanced mix between politics, pop culture and technology. Last year's searchers were Whitney Houston, Gangnam Style, Hurricane Sandy, iPad 3 and Diablo 3. When broken down by region, the results are quite revelling and definitely interesting - to say the least. For example, Margaret Thatcher only top the UK's searches - in 9th position - and was the fifth most searched person this year in the UK. Furthermore while the UK buzzed about the Eurovision, Grand National and the highly anticipated royal baby, France was interested in Roland Garros, Vendée Globe as well as the royal baby and Kate Middleton and the UAE ramadan 2013 topped the searches and Miley Cyrus was the second must searched musician. Of the questions people in the UK asked Google, “what is twerking” and "How to make pancakes" topped the list. People also seemed to be interested in understanding what "zumba", "spooning" and "global warming" were. As also, the announcement and release of new technology and gadgets got consumers interested and made for global popular searches; such as the iPhone 5s, Samsung Galaxy S4, Playstation 4 and Xbox one. You can also explore the trends globe - which allows you to discover trends worldwide throughout 2013 and on specific dates. I was asked by Talkwalker - a social media monitoring and analytics tool (along with fellow B-M colleague Elaine Cameron) to give just one social media trend marketing trend for 2014. Now I 'cheated just little' and gave a trend that wasn't really a specific marketing trend. However, I do strongly believe that politicians, institutions, governments, political parties ... could pick up some tricks and best practices form the marketing world. You can read my thoughts on the topic below and you can see the full article here. It has already started but in 2014 we will be seeing more European governments and politicians fully embracing social media – especially with the European Elections in May 2014. They will become more comfortable and open to this medium and will hopefully make the most of it, and use it in innovative ways. Social media has undoubtedly allowed a shift in the power balance to happen – from sellers to buyers, from brands to customers and also from governments and politicians to the electorate and voters. Governments and politicians will need to understand how to make the most of social media to create the necessary awareness around politics in general. And then understand how to turn this awareness into actions – and I am talking about real tangible actions more than a retweet, a ‘like’ or a share. There are two key elements necessary for the above to happen: hashtags and videos. Firstly, hashtags will become increasingly important and central as more and more social media channels are incorporating them in order to aggregate content. Harnessing the power of hashtags will allow for increasing awareness to be created around specific campaigns. Secondly, short and captivating videos will captivate and drive action. Youtube is still as strong as ever and 2013 saw the creation of numerous video and image based applications such as Instagram and Vine making the creation and dissemination of videos easier and more affordable than ever. Videos and images have already been identified as a strong social media marketing tool but I cannot wait for the political world to embrace this effective way to share and tell their ‘stories’. Will the EU get a social media election? This was the subject of a lively event organised by the European Parliament office in the UK last week. It was undoubtedly one of the most passionate debates I have attended in a while, due both to the topic and the diverse and well-balanced panel of speakers. There is little doubt that social media plays a key role in politics today, but it is debatable how much it will drive interest in next year’s elections. To read the full article visit the Europe Decides website and summary video of the great event bellow. I am not going to lie; there were tears, laughter and utter silent disbelief. Every year there are numerous campaigns and commercials that make you smile, laugh or cry, or even make you wish you were part of the team that came up with the concept. And then every so often there is a commercial that comes along that just leaves you speechless. Forget - just for an instance - that these short videos are advertisements and primarily trying to increase brand awareness and increase sales, and simply enjoy their creativity and the human moment they create. Watch Jean-Claude Van Damme carry out his famous split between two reversing trucks (with one of Enya's all time best sellers as soundtrack). Never done before, JCVD says it's the most epic of splits. This live test was set up to demonstrate the precision and directional stability of Volvo Dynamic Steering -- a world first technology that makes the new Volvo FM easier to drive. Watch the new John Lewis Christmas TV advert and see Hare give his best friend Bear a Christmas he'll never forget. Set in a beautiful forest, poor Bear is the only animal that never gets to celebrate Christmas because he has to hibernate every year. However, this year is different. This year Hare has a brilliant idea. If this does not bring tears to your eyes then you simply have no soul. Women are their own worst beauty critics. Only 4% of women around the world consider themselves beautiful. At Dove, we are committed to creating a world where beauty is a source of confidence, not anxiety. So, we decided to conduct a compelling social experiment that explores how women view their own beauty in contrast to what others see. And don't forget: YOU are more beautiful than you think! Partitions divide countries, friendships find a way. The India-Pakistan partition in 1947 separated many friends and families overnight. A granddaughter in India decides to surprise her grandfather on his birthday by reuniting him with his childhood friend (who is now in Pakistan) after over 6 decades of separation, with a little help from Google Search. These commercials have all achieved the wholly grail in advertising - getting millions of people to absorb, share and engage (with) the brand's content without it ever feeling like a sales push. Consumers might not be loyal to these brands, they might not have purchased - or will ever purchase - any of the brand's services or products but they are sharing those brand names and engaging with the content. In some cases these ads might be turned into memes or parodies increasing somewhat their lifespan and often engaging with a whole new audience. In the Volvo trucks' case, Van Damme's faces was replaced by Mayor Rob Ford, and you get #vanford. I ask you, what more could you ask for as a brand. Finally, what all these commercials have in common is stunning imagery, the perfect soundtrack and the power to take you on an emotional journey - and escape if you may - for just a few minutes. There are not merely brilliant commercials, creative content or ingenious marketing strategies. These commercials are great examples of the power of beautiful storytelling, because that is precisely what they are - stories worth telling. Some pretty impressive data here; some have me smiling because who would have thought (all the visual niche social media channels like Snapchat, Instagram and Pinterest are clearly representative of the increasing demand for visual and audio-visual content) and some have me cringing simply because we are doing it wrong (204 million emails sent in one minute just makes me sad). The poor use of email is actually a topic that I often battle with. Since working in a Global PR firm I have come across some of the worst usage of emails - a way of chatting with colleagues, sharing news and information, and updates or worse a way of managing projects. That will be a post for another day but I can see how we produce 204 million emails in a minute. I have been using Google Reader for a couple of years now and it really has proven a great asset to my blog. Having all the latest from my favourite blogs delivered right to my computer is just blissful. Well it has now shut down and now what? I actually embraced this opportunity to do a good clean out and update the blogs I was now following, delete the ones that no longer interested me - or who were no longer active - and put them into new categories. I know many of my readers use Bloglovin' to stay up-to-date with their favourites blogs and have them all in one place, but why not give these feeds a go, you might just be surprised at what you have been missing out. NewsVibe (web) is simple, straight forward and a clean way of reading your RSS feeds. It allows for a no-fuss read of all your favourite blogs and sites. It is a two column read, meaning that your right hand column are your feeds and on the left you can easily browse your folders and jump from one to another. You can also 'star' your feeds to allow you to go back and find your favourite posts at a later stage. Skimr (webapp) is a 'clean feed' reader that allows you to easily browse all your news feed headlines. You will get all your new stories - with or without a picture - chronologically in one single column to allow for easy skimming. Probably not the best reader if you actually want to read/look at the fashion posts from your favourite bloggers in one place. When you sign up for an account you can start adding and building your very own news feed by adding all your favourite blogs and sites. You can also import your previous feed if you already have one. You can categorise your feeds and add them to personalised folders. I use to have my blogs organised per country but this will probably change. However, you cannot easily jump from one folder to another as all your news feeds are given to you all at once. I would recommend this is you only follow a dozen - or maybe a bit more - blogs. Feedly (web / iOS / android) is probably one of the favourite feeds and one of the most popular Goggle Reader alternatives at the moment. It allows you to have one single RSS reader for all your devices. However, unlike the above two feeds, this is less of a constant stream of RSS and is a bit more like browsing a webzine - think Flipboard. As it is very visual and image based and focused, it actually works really well for fashion / Lifestyle / food blogs. It is definitely worth a try if you haven't yet heard of it or used it. Pulse (web / iOS / android) is another RSS feed for the visual readers out there and for those of you wanting to digest all of your favourite lifestyle and fashion blogs that are more often than not pictures centric. Pulse doesn't deliver your RSS feed in the classic and tradition Google Reader way, nor does it want to. Pulse allows for a very image-focused and visual read which is great if your feed mainly consist of visual blogs. Just like Flipboard, it already has a wide selection of categories of topics and interests. It also has a 'read it later' option which has become hugely popular and I have to say, is something I use regularly. The only 'down side' to this is that Pulse pushes to the top the articles and fees it thinks you will most likely to be interested in. Although I like the idea, I really just want to see my entire feed chronologically rather than 'browse'. And that is it for now folks, I hope you find the perfect match for your RSS feed. Last week I went to my first ever Firestarters event which was focused on a very interesting topic, that of the innovation conundrum with agencies. I was really happy to see that the panel had a great gender and mind balance to it. Innovation is something we all faced with daily without even spending a split second to think about it, but it is also something that agencies, brands and all companies - small or big - are faced with. There is a constant need, but also desire, to innovate. However, very often do people do it for the right reasons. With technology pushing the boundaries more than ever, the innovation imperative is increasingly present and strong. Some of my favourite talks were Phil Adams - Innovation is a bet not an experiment, Anjali Ramachandra - Focus on the good ideas, and Antony Mayfield - Resign thinking. Phil talked about something that I have been increasingly noticing; we seem to be spending a lot of time with clients discussing what they want and need rather than why they want and need certain things. Do we really spend enough time asking the right 'Why' questions? And if we did, would our proposals look the same? My partner often tells me you simply need to ask someone 'a why question' five times and you generally get to the core of the issue. Because when you don't you often get 'products' that neither solve a problem or sell more 'products'. Phil also mentioned that agencies have an unhealthy obsession with means. Innovation should be the end, and not the means. Which also brings me back to something that I have noticed in agencies and brands; they all seem obsessed with the technology, new apps, channels and platforms rather than the amazing content they are producing. Sure everything needs some amount of packaging, but not to the extent that it takes the focus off of what really matters; the content. One of the quotes of the evening that really stuck with me and had me thinking on my walk back home was mentioned by Anthony Mayfield, from Brilliant Noise. The quote originally came from Netflix's Chief creative Officier, namely Ted Sarandos, who said about Netflix that "the goal is to become HBO faster than HBO can become us." Now is Netflix doesn't represent pure disruptive innovation then I am not sure what does. From the point of view of a global PR agency, I really do believe that we need to start thinking more like start-ups and deliver change rather than solution 'to keep up with times'. This is of course easier said than done; but we should certainly try to think outside the box and ahead of times, and convince our clients that they should be doing the same. Because in all honesty, clients - brands and companies - don't want to follow trends they want to make them. But for this to happen, they need to be willing to take the risk and work with agencies that will offer bold solutions that both solve problems and change the ways things are done and thought of. There is undoubtedly the need to make room for innovation whatever agency you work in, but we should not get distracted about the innovation in itself but rather focus on what problems need innovative solutions. This being said innovation should not only be in our ideas but should also be present in our work space and work process. Have you ever wondered where your private life ends and your professional life starts? Well ten years ago this might have bee a easy question to answer. Today however, the answer is somewhat more complicated. Social Media and new technologies have rendered the separation of our private and our public life somewhat obsolete. Our two worlds are clearly colliding, and a clear separation is going to be increasingly hard to maintain. I would even argue that you might not want to keep such a distant separation between the two; as your 'private life' might just help, and even advance, your carrier, even more so if you share it online and step out of your comfort zone. I am a strong believe that lessons and skills learnt in 'one world' - be it your private or professional life - can be useful and definitely valid in another. You will be surprised to find out the extent to which some of your skills are goldmines for your future employer. These same skills will also allow you stand out as a potential candidate and employee. Take me for example, the skills I taught myself and openly shared on Twitter, LinkedIn, Google Hangout, Facebook and here on the blog, allowed me to stand out both for employers and as a speaker for various conferences - such as the State of the European Union and Google @6. But more importantly, they allowed me to have some of the most memorable experience, whilst making my CV that much more interested. Most of the opportunities I have had where in oen way or another linked to my online presence and social media/digital skills. Find bellow the presentation I gave in 2012 to the Blue Book stagiaires of the European Commission at the 'Ideas that Matter' event. 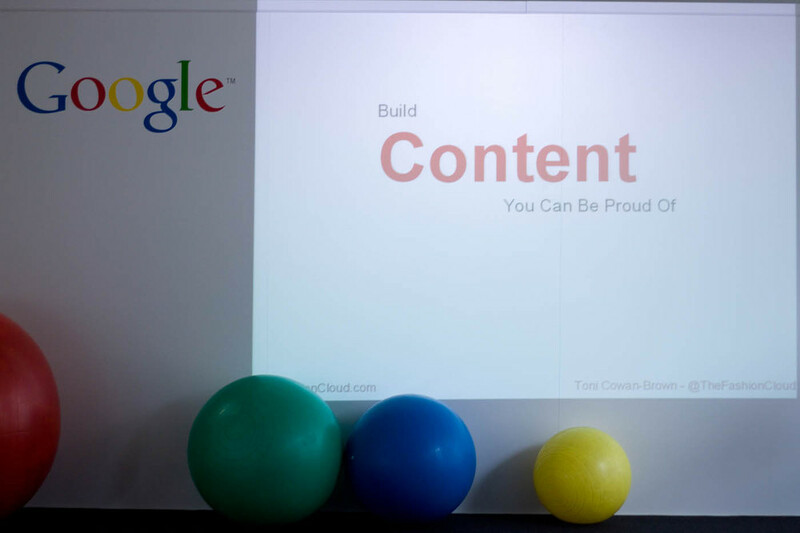 I just realised - as the year is coming to an end - that I never shared with you the pictures from my talk at Google. There aren't that many, because boy do I pull some strange faces when I talk. 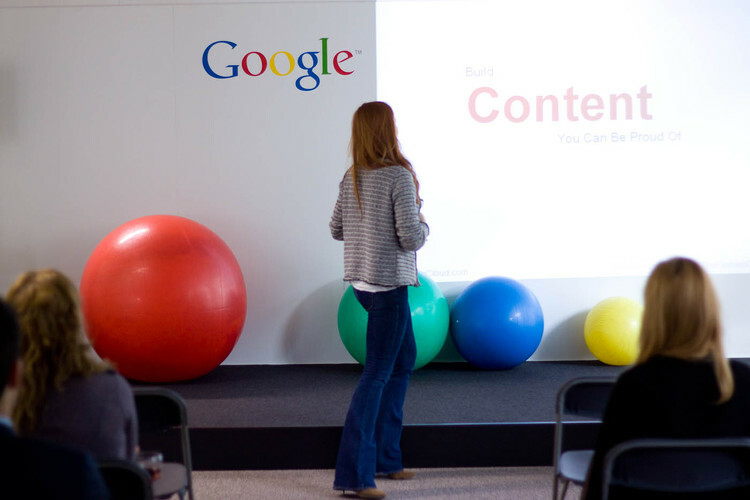 Anyway, I was invited by the people at Google to talk about the importance of online branding and trending online. It was a great experience, and the audience was amazing. Was I nervous, hell yes and I think you can tell from my awkward smile in pic n°2. This is just one of the many opportunities, resulting from my on-the-side blogging, I am very thankful for. Thank you again to the Google team in Brussels for the kind invitation and great hospitality. What are your most memorable experiences or events of 2012? You have probably heard about the Adria Richards saga and the multitude of debates that followed on the feminism and sexism in the tech industry. If you haven't, you can read all about here or here. - Adria Richards, a SF based and self proclaimed "developer evangelist" for the cloud-based email delivery service, namely SendGrid was attending Pycon and overheard a joke from two fellow attendees. - Her first reaction was not to turn around and ask the two attendees to stop what she thought was 'sexist' jokes but rather to tweet the following to her large following of 12.000 followers. - Within less than 20 minutes, someone from Pycon spoke and then proceeded to remove the two men in question from the main event. Pycon then tweeted that they had "dealt with the situation". - If only it had ended there. However, this was far from the case as the last 10 days have demonstrated. - Unfortunately, it didn't end there. One of the jokesters was fired from his job. The other, who worked at the same company, was not. Richards, followed up with her tweet with a blog post on her blog - which is interestingly entitled "But you'r a girl". - One of the guys in question apologised on Hacker News but was later fired. - And so was Adria Richards. SendGrid released a statement on Facebook explaining that "Effective immediately, SendGrid has terminated the employment of Adria Richards.while we generally are sensitive and confidential with respect to employee maters, the situation has taken on a public nature." Personally I am not going to argue about the place of women in tech or sexism attitudes in the workplace. This is an age-old debate and I don't believe I can add anything interesting at the moment to the debate. However, I do find this case fascinating in that it very clearly demonstrated the importance and the place of employees on social media and beyond. Never before have employees been so present, open and transparent, and also vulnerable. Both the employees and companies need to be prepared as to the consequences - both good and bad - of such an online presence. Take Adria Richards, her claim that she was not impressed with the two guys behind her making 'sexual jokes' was hardly news-worthy, even when she had shared her disgust with the people at Pycon. It was the fact that she voiced this concern online to her 12.000 followers by publicly shaming the two individuals with a picture she took while the two were in a private conversation. This quickly spiralled out of control and Richards' employer SendGrid quickly found itself in the middle of polemic that even found itself in the traditional media. In this case, Adria Richards was all but a 'brand ambassador' for SendGrid. With the rise of social media, employees are more than ever becoming brand ambassadors, advocates and an open-window into any company. No wonder banks have for so long shied away from social media and been reticent about employees as such on online platforms. Companies clearly need to be more strategic when it comes to their employees online presence as they are no longer merely hiring the right people for the 'job' but they are also hiring potential 'brand advocates'. The 'collective power of employees' is not new, employers have for a long time understood the benefits of having employees as 'brand ambassadors' and have done the necessary to make this happen. However, with the online space emerging, every single employee with an online presence can potentially act as the face of the company - for better or worse. Richards put her employer in a somewhat awkward position when she claimed that they were 100% behind her on this. This year companies and organisations are clearly getting serious about social media. Not just a core practice dedicated to all things social for the company nor simply a mere few managing the social media presence of the entire company. 2013 should be about strategically involving all - or nearly all - of your employees in the hopes they become brand advocates and/or brand ambassadors, all delivering on the brand's promise. Of course, it is not just about the brand promise, it is also about growing revenues, making profit and gaining new clients and securing 'old' ones. Such a strategy requires a lot of planning, the right technology, a fair amount of trust and mandatory training. However, before any of this is done companies need to understand the purpose of such greater presence and engagement. Passionate employees should be encouraged to be present, active and vocal online, and must employees would probably happily promote 'their' company and employers in the best light possible, if only they were given more guidance, understanding, direction and training. Personally, I find if far more interesting and captivating to follow passionate and creative employees than a company 'logo', I get far more insight about what the company does and what it stands for. I am probably an interesting case for my employer as I first 'branded' myself online as The FashionCloud three years ago when I launched my Fashion Blog. It so happens, The FashionCloud as an identity stuck to this day, and I don't think I will be changing it to something 'more appropriate' or 'serious' any time soon. Thankfully, the Cloud, is now a 'hot topic' making my twitter handle stand out somewhat less on Twitterwalls at conferences, for example. Why do a new section on the blog dedicated to new - and old - technologies and innovation? simply because my real passion lies in this area, rather than in Fashion. Not that I find the fashion industry fascinating but it won't really get me out of bed at 5am to write some thought pieces. This being said, the way the fashion industry is making the most of the changing media landscape and new innovative technologies is fascinating, to say the least. I did think it was time that I dedicate a space on my blog for women - and men - who share the same passion as me in all things digital and innovative tech. I guess this is the first step towards creating a second blog, if I ever find the time. I won't be creating a separate Twitter account or new online profile for this blog, simply because I believe we should follow humans and not blogs, website or companies. And as a human I am interested in a multitude of things, including fashion - to a certain extent - as well as innovation, new technologies and our ever-changing digital era. So if you follow me you will get some EU politics, some fashion and some tech. WHAT? Google@6 is all about taking a bit of time out each month to relax, enjoy some drinks, sit in Google's awesome massage chair, play a round of baby foot, and most importantly learn about something new. This month’s Google@6 will feature Toni Cowan-Brown of thefashioncloud.com who will speak about how she turned her fashion blog into an online 'brand' and business, using a camera, a blog and some savvy skills. Toni Cowan-Brown graduated from the College of Europe in the summer of 2011. She is the author and creator of a fashion blog - The FashionCloud. In two years her blog has grown to 3 000 visitors a day and has been featured in ELLE, IDEAT, Victoire, The Guardian, the Independent and le VIF Express. As a result of this she was asked to reflect the views of young digital entrepreneurs about the future of Europe. Toni currently works at the European Commission. Toni is speaking in her personal capacity and the evening will represent her personal views only. April 26th from 18.00 onwardsWHERE? I thought I would let the invite talk for itself, but of course the bottom line is: if you are in Brussels and have nothing to do this Thursday feel free to drop by. On another note, I feel very privileged to be one of the finalists of the Weekend Blog Awards - in the fashion section - along some of my favourite blogs and inspiring people. I would love for you to vote for me, however due to the very complicated voting system I am not really going to rallye the votes as I don't think voting should be this complicated, especially when done online and for something as easy and laid-back as voting for your favourite blog. Not quite "Goliath vs. Goliath"
We will remember the 18 January as the day the Internet partially blackout-ed. Indeed, it would see that many have woken up to the worrying fate that awaits us if bills such as the proposed SOPA (Stop Online Piracy Today) and PIPA (Protect IP Pact) are ever passed. I have been annoying fellow co-workers, fiends, family and Twitter followers for the last couple of weeks about these bills, and explaining them and their worrying impact with great difficulty. I am glad to say that it seems to have become a trendy topic, but please don't mistake these bills as the latest Bieber Fever. They represent so much more than a hip and trendy topic to discuss over casual drinks or fancy dinners. These bills, if passed, could potentially change forever our FREE and OPEN Internet as we love and know it today. Firstly, these two bills - SOPA in the United States House of Representatives and PIPA in the US Senate - are very poorly drafted and written by peoople with an average age of 61 and "who fundamentally misunderstand how the web works". Secondly, they will not achieve the goal they have been created for - i.e. to tackle copyright infringements - and will do more harm than good, with innocent online users primarily effect. Thirdly, it will set a dangerous precedent that will potentially put an end to the creative side of our open and free Internet. A creative side that has us uploading and sharing billions of videos worldwide, sharing information and breaking news of events worldwide, creating new political voices, discovering new talent daily ... Fourthly, it will hold accountable all website owners for any contributed material which will result in the COMPLETELY UNNECESSARY shutting down and the blocking of ENTIRE SITES. If on the one hand, this is not a 'David vs. Goliath' battle but more of a 'Goliath vs. Goliath' battle ( i.e. the music studios and record labels vs. Massive user generated sites such as Youtube, Google, Facebook...) Indeed, let's not kid ourselves in thinking this is all about 'the greater good' as there is certainly an amount of commercial self-interest motivating both parties. On the other, it is much more complicated than this, and many other actors are involved and will be the harmed if these bills pass. Take Wikipedia and Reddit for example, neither have any financial self-interest at play (they don't sell adds or monetize traffic). Take the billions of blogs that have been created so far, all will be affected and could potential face darkness. Except this time it will not be to raise awareness like today, it won't even be your own doing and will be completely out of your hands! As a blogger, someone who attracts readers by creating and sharing mostly original content on a daily basis and who has personally seen both my image rights and personal content violated, I am the first to say that our generation of media tools need more effective legislation. Especially when it comes to IPR (intellectual Property Rights) and tackling online piracy. Further more, "from the moment the Internet and websites arrived, a veritable Pandora’s box of opportunities have opened to every average Joe and Josephine in the world", why would we ever want to go back in time. Finally, Both bills attempt to tackle online piracy and copyright infringement respectively by actually infringing on our individual freedom of expression and our knowledge sharing. There is no doubt that these bills are a far cry from being an effective, let alone fair solution. Neither are dead, contrary to what is being said, they are still a dangerous threat that we should never be faced with again. SOPA is still to be discussed early February and PIPA will possibly still be debated. Are you really ready to say goodbye to Tumblr, Reddit, Youtube, Twitter, Facebook, Wordpress, Blogger... These bills have expanded the meaning of infringement and copyright to the extent where sharing information would be a felony in itself! If you feel concerned, and hopefully by now you do. Go learn a bit about these two ludicrous bills and then go and do what our generation does best and spread the word and the awareness. For a laugh, go check out Oatmeal's blackout page and Wikipedia's handy Q&A page. 2. Flipboard: This is without a doubt one of the best things that has out of the Ipad, it has been called "a true testament to the iPad's transformative powers". Basically, Flipboard scrapes your Twitter, Facebook and RSS feeds for interesting links and then arranges them in a simple, fun and beautiful magazine. You can also custom it by adding and deleting categories that you are interested in. Free. 4. TED for iPad: First things first if you have never heard of TED, please run over there now and check it out. TED talks are simply some of the best and most inspiring content from some amazing people the internet has to offer. With the Ipad app you can watch these videos at your own speed and even save some for later. Free. 5. Netflix: This is like the biggest archives of old and new TV shows and DVD imaginable. And what better than to be able to curl up in bed and stream these to your heart content. Again, you can save some for later, put films asides, have them offer you 'your kind of film', and with winter coming this has to be an essential app to have. A subscription is needed. Free. 6. Instapaper: If I am honest, the single biggest thing I use my Ipad for it to watch videos and read, whether it is newspapers, magazines or various articles and pdf documents for my studies. Instapaper turns all those articles you safe and put aside to read later into clean and user friendly documents, stripped from all the "web junk" one finds on websites whilst trying to read articles, and basically "leaves you with the sweet, pure text". $5. 7. Reeder: This is basically your RSS feed on your Ipad, allowing you to be kept up to date on all your blogs and website, thus leaving you with plenty to read and enough tome to read them all. According to Reeder, it "is the cleverest, prettiest way to sift through it al"l. $5. 8. Dropbox: have you ever wondered what all this "cloud computing" was all about? Really, what is all the fuss? Well look no further, with Dropbox you can, with one simple click, send all your big files and pictures on your Mac/PC into the clouds, quite literally. Meaning you can access them from anywhere in the world. With the Dropbox app you can access them on your Ipad, at any time and in any place. It has some of the best traits you look for in an app; "It's quick, it's clean, it works, and it's free". 10. Qwiki: There is no other way to explain this, other than it is a "visual Wikipedia". A great way to kill time when you are bored or waiting for your plane, train or any other means of transportation. Plus, you are learning cool stuff on the go as it delivers its information in the form of a narrative, with images and even audio comments. Free. 11. IMDB: As most of you know I am a huge TV series addict. Well, I don't smoke, I don't drink coffee so I did need something to get me going. The new app delivers all the information on upcoming (and old) movies, trailers and showtimes, so that you can stay up to date with anything coming to the screens near you. Free. 12. Alien Blue HD: Again, if you don't know Reddit please go and check it out, and just like Twitter, you need to give it and yourself time to understand what it is all about and fully take in all that it has to offer. This app is Reddit's client, and it is the "natural evolution of Reddit for a large touchscreen device". the design is just perfect and the format , again, is very user friendly and allows for better interaction. 13. Friendly: Now, for those of you who know me a bit, they will probably know that I am not a huge fan of Facebook, actually we are probably frenemies! Nevertheless, Friendly did a pretty good job. It is "the best unofficial Facebook app on the iPad because it does everything you'd want the non-existant official Facebook app to do". So if you are a Facebook addict, go for it. Free or $1. 15. New York Times for iPad: I think it is safe to say that after a rough start, the NYT app is looking pretty amazing, and has delivered a clean user friendly app packed with great content and information. 16. CNN and/or BBC: I am personally more of a BBC user, but again it comes down to a personal choice. However, both have similar great traits; best ways of keeping up-to-date with the world news, with breaking news feeds, videos, audio comments, and top stories. ALl very weel categorised, and very user friendly and easy navigation. Free. 21. Flight Control HD: This is one of those addictive games that looks easy and quickly has you screaming at your tablet for not reason. This one has you directing air traffic, that quickly turns into utter mayhem. A fun and actually energetic way to waste your time. $5. 22. Tiny Tower: If you like SimCity, this is the game for you that has you playing a landlord, where "you build floors on a tower to attract "bitizens" to live in it and then control their lives (manage, hire, give a job, evict)". I have yet to try it but I have been told it is good fun. I have been asked quite a few times what apps (for iphone and ipad) I couldn't live without. So I thought I would do a nice (and very short hum hum) post about all the apps for ipad that I am loving at the moment. Hope you enjoy it and find it useful! And, of course, if you have any other ipad apps that you love and can't live without that I did not include in the post, please do share. Good morning! So I had received my invitation last week to say that I had been selected to walk in the world's biggest fashion show, that is taking place tonight in paris,and organised by the famous Galleries Lafayette. Last night, I started thinking about different outfits I could wear, and this morning I woke up at the crack of dawn, as we had to be at the Palais by 9 am. So, me and my maxi leo dress hoped on the metro direction La Bourse. However once I arrived there, it all started to dawn on me - this is just not my kind of thing, but I would give it a shoot anyway. I am more of a behind the scenes kind of girl, which for a blogger might sound weird. So I stood around for about na hour and a half and started reading my emails. Then I received an email from a Politics and International relations student asking me question about "the European dream" as he was writing his Bachelor thesis on this subject, a subject that I know a bit about, but more importantly one that I am fascinated with. Then all of a sudden, it hit me; even thought I like fashion, and find it a complex and amazing part of our lives, I would rather be at home writing to this student and sharing my thoughts and views on the future of the European Union, and our so called "European Dream". So, I snapped a few pictures and headed on home. Now, don't get me wrong, I love this blog and all the events I go too and all my readers and fellow bloggers I have meet and gotten to know along the years. And, I am definitely not going anywhere, I just realised that some things are just not for me, and as much as I enjoying blogging about fashion and the crazy trends the fashionable people come up with, I do also enjoying doing other stuff more. I wish all the participants of the world's bigest fashion show all the best, and hope they have the most amazing time. I, on the other hand, will be cheering from the crowd tonight with fellow bloggers and friends Sophie and Mireille.